Hawley grew up in Lexington, Missouri, and graduated from Rockhurst High School. He then attended Stanford University and graduated with highest honors in 2002 with a Bachelor of Arts degree in History. He moved to London and taught at St Paul's School, London, for a year. Hawley then attended Yale Law School, where he led the school's chapter of the Federalist Society and received a Juris Doctor degree in 2006. After law school, Hawley was a law clerk for Judge Michael W. McConnell of the United States Court of Appeals for the Tenth Circuit. He subsequently served as a law clerk at the Supreme Court of the United States for Chief Justice John Roberts. During this year, Hawley met his future wife, fellow Supreme Court clerk Erin Morrow. In 2016, Hawley ran for Attorney General of Missouri. He faced Teresa Hensley in the general election on November 8. Hawley won 58.5% of the vote to Hensley's 41.5%. In October 2017, Hawley officially declared his candidacy for the Republican nomination in Missouri's 2018 U.S. Senate election for the seat held by Democrat Claire McCaskill. 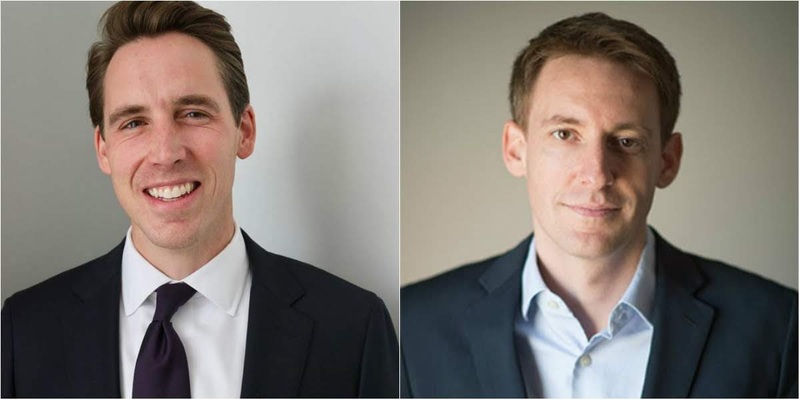 Hawley was endorsed by President Donald Trump in November 2017. On November 6, 2018 Hawley was elected to the represent Missouri in the United States Senate. Kander was raised in Shawnee, Kansas and graduated from Bishop Miege High School in 1999. He then attended American University, where he studied political science. While earning his law degree at Georgetown University, he earned his commission as a second lieutenant through the University's ROTC battalion. After completing his law degree in 2005, he volunteered for a tour in Afghanistan, where he served as an intelligence officer. When he returned home, Kander took a position as an instructor at the Missouri Army National Guard's Officer Candidate School at Fort Leonard Wood. He also worked as an adjunct instructor in political science at the University of Missouri–Kansas City, and as an attorney at local law firms. Kander was elected to the Missouri House of Representatives in 2008, representing the 44th district. On November 6, 2012, Kander narrowly defeated State Representative Shane Schoeller and was elected Missouri Secretary of State. On February 19, 2015, Kander entered the race to represent Missouri in the United States Senate against Roy Blunt, the Republican incumbent. In the general election, Senator Blunt was reelected with 49.2% of the vote. On June 25, 2018, Kander announced that he will run for mayor of Kansas City in 2019. Prior to his announcement, Kander had been repeatedly mentioned as a possible contender for the Democratic nomination in the 2020 U.S. presidential election. Speculation about his presidential ambitions had been fueled by his frequent visits to the early primary states of Iowa and New Hampshire, and Kander himself had suggested he would consider exploring a bid after the 2018 midterm elections were finished. Kander dropped out of the race on October 2, 2018, citing symptoms of PTSD and depression. He also announced that he would be stepping away temporarily from his work with Let America Vote as he receives treatment. One man abandoned his home state in search of the political spotlight...he lost. One man adopted marketing gimmicks like appearing on all the liberal television shows and writing self-laudatory books...he lost. One man sought to be a leader of a party on the decline…he lost. One man let his ambition get way out ahead of reality and started prematurely aiming for the White House…he lost. Moral of the story: Be true to your home state. Be humble and patient. When your party is in power, ride the wave. Or cage fight, carpet munch, use affirmative action and race. Then pander to a county full rich bleeding heart libtard women even if you have never lived there. In the end, Kander will have a much better career. Hey, I like Hawley, he's a RINO and will likely vote to impeach the president. Hey, at least Josh Hawley gets to go home to Washington, DC - where he's spent most of his adult life. Doubt we'll ever see him in a dump like Missouri again. EXCEPTIONALLY SALTY PERSPECTIVE...I LIKE IT!